(I apologize for the delay with this post, I had to work on updates for Yoink, ScreenFloat and Briefly and of course lots of work happened on flickery 😉 ). To finally continue with my promised series of blog posts about flickery 2.0’s development, here I am back with: Uploading. A minor disclaimer before we start: Any interface you see below isn’t anything near final, subject to change, etc etc. 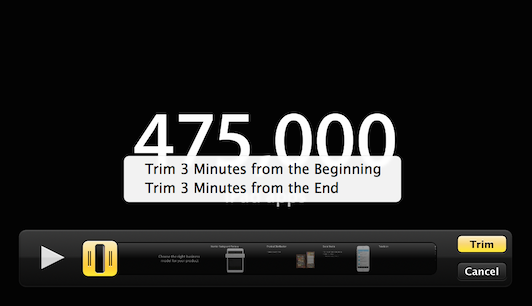 If there is one part that’s integral to any flickr client, it has to be uploading. So with 2.0, I want to make darn sure that it’s the best you can get. In flickery 1.x, uploading blocked the entire app so you couldn’t do anything else but wait. Sure, you got a beautiful sheet window to look at with the currently uploading image slowly transitioning from blurry to focused representing the upload progress, but it wasn’t very user-friendly. I wanted to change that with 2.0, so now uploads will be in the background, in the app-wide Activities panel where you can track the progress and potential errors of Up- and Downloads. It’s out of the way, you can close it and leave it running in the background (and of course the little image also transitions from blurry to focused 😉 ). When the activity (Up- or Download) is finished, you’ll get an OS X notification letting you know the activity is done. Another advantage of background uploads is that you can queue them up. You can begin one Upload and while that is running work on the next. And when you start that one, it will wait for any previous Uploads to finish and then begin uploading. 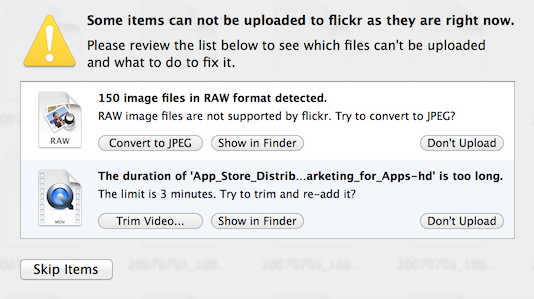 Adding to Photosets or Groups for uploads is not very straightforward in flickery 1.x for Uploads. You can’t assign photosets right from the Upload view but have to wait until the upload finishes and the button bar at the bottom changes to “Add to Set” and “Add to Group”. By the time the upload is finished, you might not know anymore which photos you’d like to add to which photoset or you forget altogether. It’s not really a “set it, then forget it” approach. This is going to change in flickery 2.0. Here, you’ll be able to set everything up beforehand and once the upload itself is done, photos are added to the photosets and groups you have set. So you can set everything up and leave it to flickery to do its thing. 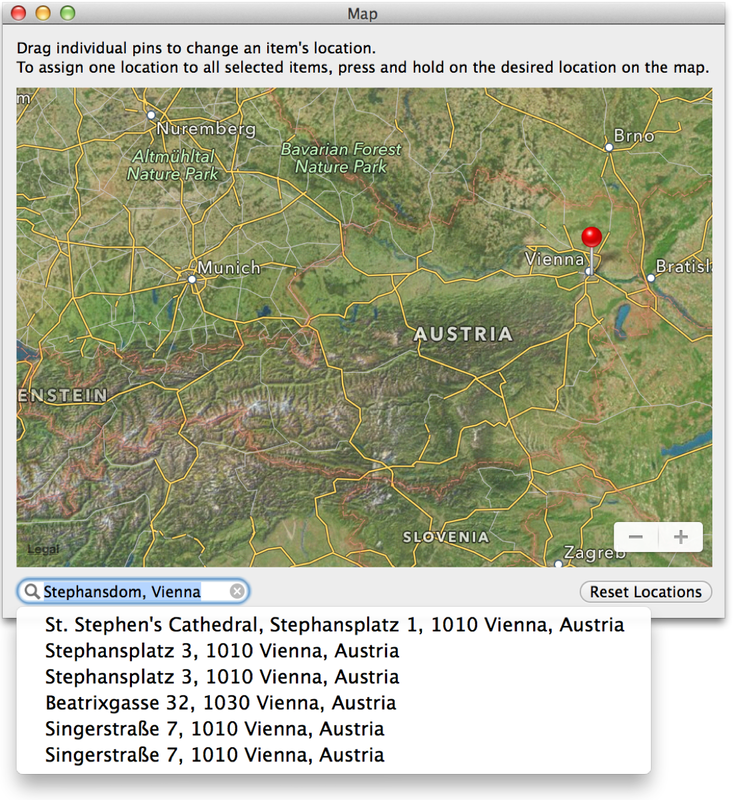 In flickery 2.0, it will be even easier to assign locations to selected items (both photos and videos) using Apple’s MapKit features. The big improvement here is that you can now search for locations and flickery will reverse-geocode that info into a latitude/longitude pair that Maps can understand. If you have a camera without GPS and want to assign a specific location, this comes in very handy. I’m adding better sorting to flickery with version 2.0. As you can see in the screenshot below, you can sort by Date and Title (booooring) but also by location, for example, based on the distance from the selected item. Items without a location will be sent to the end of the list. Using Google’s Maps APIs (because Apple’s reverse-geocoding is a little bit limited), flickery will also let you sort by Country, City and ZIP/Postal Code. 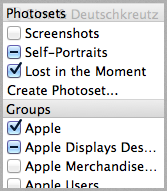 This comes in very handy when you’re deciding which photosets to add to, for example, or just for the general order of the uploaded items and how they will appear on flickr. Sadly, Google’s APIs are limited as well (2,000 requests per day per IP address), but it’s better than Apple’s limitation (which gives out after about 50 consecutive requests – bug report filed! – and yes, I am not geocoding all items at the same time but one after the other, as “demanded” in Apple’s CoreLocation documentation). But I don’t think too many will run into issues with that. Dealing with many items for upload, it can become overwhelming trying to keep track of everything. With flickery 2.0 I want to simplify that by implementing filters, so you can quickly view only photos or videos, items with or without description, tags, location and if you’ve assigned a photoset/group or not. That wil make it easy for you to keep on top of everything and make sure you’ve done everything you had planned for your upload. Just like in flickery 1.x, flickery 2.0 will let you quickly convert RAW files (which flickr doesn’t accept) to JPEG files, trying to keep as much EXIF data as possible (which is new in 2.0). I’m not sure yet about how deep I want to go into editing (if at all) with flickery 2.0. I figure, most items will come from iPhoto or Aperture anyway, already post-processed by an app that can do it better and is focused on it more than flickery ever would be. Perhaps I will include very basic editing functionality like rotating and mirroring, but I think that will be about it. With all this detailed uploading stuff, there needs to be a way to quickly upload something into your stream, a photoset or a group. So with flickery 2.0, when you drag an image- or video file onto your stream, a photoset or a group it won’t fuzz about and just directly, quickly upload it without you having to do anything else. This entry was posted in Cocoa, Software, User Experience, User Interface and tagged flickery, flickr, mac, Mac App Store, os x by Matthias Gansrigler. Bookmark the permalink. Can’t wait to see the final v2 app! Should I wait for the new version or buy V1 and get the new version free once released? sorry my english. flickery 2.0 will be a free upgrade for everyone who purchased flickery 1.x on the Mac App Store. Nice changes, keep up the great work! Yes, flickery 2.0 will have options to view your timeline by date taken. Thank you, I will look into that. Though the upload date can be changed before/after the upload in flickery 2.0, there’s no option to “set upload date to date taken”. So again, I will look into that.